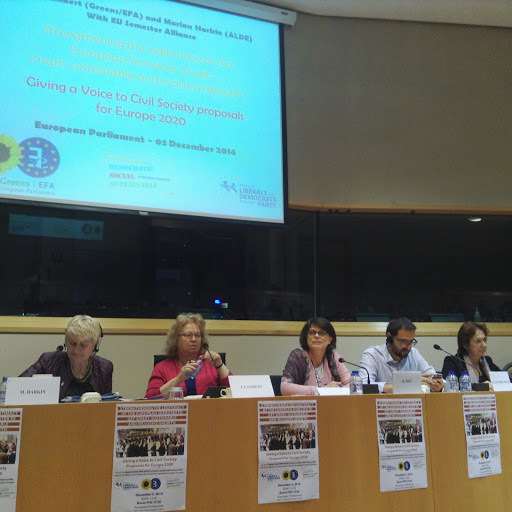 On the 3rd December, the EU Semester Alliance held a well-attended hearing in the European Parliament, hosted by Hon. Jean Lambert MEP (Greens / EFA) and Hon. Marian Harkin MEP (ALDE). It is the second such hearing organized by the Alliance in 2014, presenting to decision-makers and stakeholders the Alliance’s assessment of and proposals for a democratic, social and sustainable way forward for the Europe 2020 Strategy and the European Semester in 2015. The hearing began with a presentation of the key messages and learning from the Alliance’s new report Let’s make the European Semester smart, sustainable and inclusive. The focus were the important shortfalls on the social and environmental targets of Europe 2020, which are far from being on track and concerns about the operation of the Semester, particularly the CSRs in delivering on these goals. Equally, stakeholder engagement in the European Semester has left a lot to be desired, as national Parliaments, trade unions, beneficiaries and their civil society organisations find themselves locked out of the process, unable to gain ownership of the Europe 2020 project, or to provide it with much-needed democratic legitimacy. (See the Alliance’s full Key Messages below). The analysis and messages of the Semester Alliance are deeply rooted in national realities and the work of the national members of its organisations. In this context, three national cross-sectoral alliances were piloted in 2014, as part of a Joint Action project financed by the European Commission – Bulgaria, Denmark, and Ireland – and each of them presented their work, main messages and achievements during the project, highlighting its usefulness and added-value. The event equally included responses from European institutions, namely the European Commission, the European Economic and Social Committee, and a comprehensive panel of MEPs, representing 6 political groups (S+D, EPP, GUE, ALDE, EFDD, Greens/EFA). All institutional speakers underlined the importance of Europe 2020 and of reaching its targets and objectives, particularly the social and environment ones, and stressed the importance of meaningful, structured dialogues with national and EU stakeholders, including beneficiaries and their civil society organisations. EC, EESC and EP representatives also expressed their support to the continuation of the Alliance’s work in 2015, highlighting the importance of bridging the gap between citizens and decision-makers, and ensuring that the former have their say in policies that affect them, particularly in the framework of Europe 2020 and the European Semester. Open the full report of the hearing here. Let’s make the European Semester smart, sustainable and inclusive – Report on the European Semester, and contribution to the Mid-Term Review of Europe 2020. Barbara Helfferich, European Anti-Poverty Network, Chair of EU Semester Alliance with Richard Pond (EPSU), Mary Collins (EWL) and Constanze Adolf (GBE). 1. AGS 2015: Where are the Europe 2020 goals of sustainable and inclusive growth? The AGS focus on a 315 bn, market-led investment plan with more structural reform and austerity, offers little hope of progress on Europe 2020 poverty, social and environmental targets, or tangible results to citizens. 2. EU Guidelines to ensure structured dialogue with stakeholders and partnership with Parliament. The AGS 2015 calls for more ownership/legitimacy with stakeholders and national parliaments. Obligatory Guidelines are needed to ensure genuine accountability and meaningful dialogue with civil society organizations and trade unions, making national and European Parliament equal partners. 3. Refocus European Semester on balanced Europe 2020 agenda to promote smart, sustainable and inclusive growth and equality, including gender. The Semester is overly focussed on economic governance and austerity. It must affirm its commitment to Europe 2020 goals and targets to deliver long-term prosperity, sustainable development and social justice, based on fundamental rights for all. 4. A European Semester, backed by integrated strategies including ‘Social Investment, More and Better Jobs, Environmentally Sustainable Development and Gender Equality’. Europe 2020 targets, particularly on poverty, employment, education and training, climate change and energy efficiency provide a strong coherent agenda, but these must be more clearly backed by integrated strategies for delivery. These must mainstream existing EU approaches developed in key Commission documents, which reflect the kind of society and economy that Europeans want. 5. Greater coherence and transparency in decision-making process and in delivery of Country-Specific Recommendations based on the Europe 2020 goals. The Semester is currently a closed process between Commission and Member States, overly-dominated by Ministries and DGs focussing on macroeconomic and fiscal surveillance. A clear link must be demonstrated between the CSRs and Europe 2020, more faithfully balancing the evidence of economic, social, equality and environmental data and balanced roles for social and environmental officers/bodies. 6. Ex-ante social, environmental + gender impact assessments and revised indicators. The lack of coherence between economic, social and environmental policies could be strongly improved by embedding effective processes for ex-ante assessments in the policy making process, to prevent negative policy decisions being made which undermine the core objectives and generate greater challenges and costs in the medium and long term. 7. Improved links between European Semester and European Funds, particularly Structural Funds. European Structural and Innovation funds are meant to support Europe 2020 goals. This commitment must be fully operationalized and monitored, together with stakeholders and Parliament. Funds should be made available to support engagement in the Semester process at national level. ← Give a voice to civil society in Europe 2020!